This hopper features a capacity of 6000 lbs. and a maximum volume of 3 cubic yards. Automatically dumps materials when bumper release is activated. 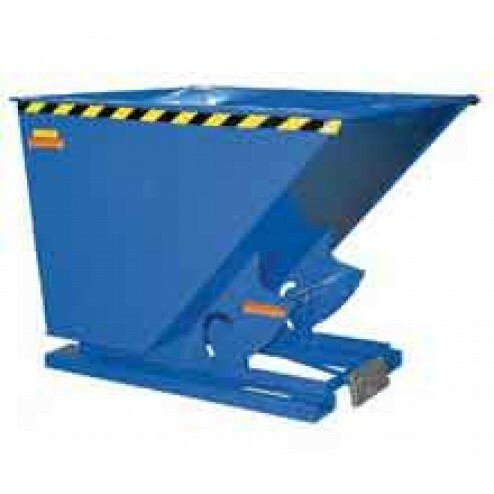 The Vestil D-300-HD Self-Dumping Hopper is a heavy duty hopper featuring 28" fork pocket centers. Volume Capacity: 3 cubic yard. Fork Pockets: 7-1/2" x 2-1/2"
Constructed of 8 gauge steel. After hopper automatically dumps into dumpster it returns to an upright, locked position. Manual dumping option made possible by a cable operated from the seat of a fork truck. Locking chain secures hopper to fork truck. Constructed with consistent robotic welds for a durable and reliable operation.